My wife's christmas present was a baking course at the Lighthouse Bakery, a small bakery focussing on teaching and some wholesale. We were 4 participants and made some wonderful breads out of 5 different doughs using biga, rye sourdough, sponge, poolish and pate fermentee. The most surprising and spectacular of the breads we made was the pugliese, which is also the "signature" loaf of the Lighthouse Bakery. This bread is made with strong flour, water, salt and yeast, and yet has a sweetish, creamy crumb. It keeps well and is still excellent as toast 4 days after baking (given it survives that long). The biga can be stored in the fridge and keeps for a week. Mix and ferment at room temperature for at least 1 hour (until the yeast gets going), then put it into the fridge overnight. It will expand further, so choose an appropriate bowl. The given amounts make 1 loaf. Mix and work the dough. Our teachers recommend to use a mixer: 5min on medium speed and 5min on high speed. I have no mixer; but I got great results with Bertinet's slap and fold technique. Bulk ferment for about 3 hours (until trebled in size). Shape into boule, be careful not to handle the dough too hard, it's quite sloppy at this stage. Avoid using flour on the worktop. Put the dough onto a baking parchament for the final proof (about 1 hour, check with the finger test). Then dust it with flour and dimple it with your fingertips - a bit like captain Nemo playing the organ in his submarine. But the oven spring is quite amazing, and on the course when the oven door opened there was an astonished Ooooh in unison. Bake for 35 to 40 minutes at 220C without steam. It needs to rest a couple of hours after baking, the taste improves a lot and you are rewarded for your patience. What do you consider Strong white flour ?? Here in the UK this flour has a protein content of 11.8% to 12.8%, depending on the brand. From what I found in the forums on this site (I have never baked in the US) I would give it a go with something like King Alfred AP flour. If that is too weak, mix in a bit of canadian high protein flour. Thanks for posting, Juergen. I have a recipe for pugliese that I have been meaning to make for years (the picture looks so enticing) but have never got around to it. I think I am going to try your recipe first. That crumb looks great. By the way, is it meant to have no salt in it (my recipe has salt and olive oil)? What other breads did you make on the course? What a thoughtful wife you have to give you such a nice gift! Thanks for noticing, Syd. It's 2%. It happensed to me in my previous post as well. 1. A Bloomer and a Cottage Cob from eighth sponge white dough. We brought the Cottage Cob to oa friend who had the idea to eat it with butter, cornish cream and strawberries! The pre-ferments were ready to go, and the day was on a tight schedule to get it all done, walking miles between worktop, oven and proof pox. 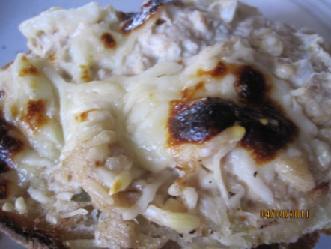 Thank you so much for sharing this recipe with us, Juergen!! I have wanted to try your Pugliese bread as soon as I saw your post here. I also appreciate to take the time write up well. Probably the salt's percentage is round 2%? This one looks awesome, too! Thank you, Akiko, for your kind words. For the biga I used 100% raisin yeast water, for the final dough I used 2/3 raisin yeast water and 1/3 filtered water, at 70% hydration. No additonal yeast has been used. Again I had to fit my schedule around spontaneous family activities - I put the dough into the fridge during bulk rise, and got rather fat in there. I think after taking it out of the fridge I could have let it rise longer. 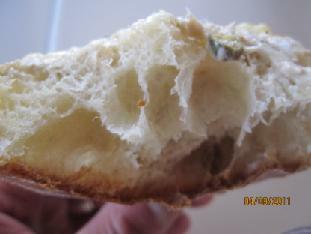 Anyway, the result is very delicious, the sweetnes from the raisin yeast goes well with this bread. We had it tonight with smoked salmon and horseradish cream. Akiko, Thank you for your inspiration. Thank you so much for your compliment, Juergen!! Thank you for sharing your great experiment, Juergen!! What a wonderful crumb you got! I always put my multi-build levain with raisin yeast water in the refrigerator as soon as I mix the dough. When I fermented step2-3 levain at room temperature, the dough got little sour like Hamelman's Pain Au Levain. Surprisingly, it becomes to stay mild in the refrigerator. Isn't interesting? It takes 1-3 days until doubled. but it is worth it. The crumb is very shiny and moist. I haven't tried your way.. I will put the final dough in the refrigerator to ferment when I make your delicious pugliese with my raisin yeast water. I think that raisin and apple yeast water don't get sourer like other kind of fruit yeast water even they are retarded.. Thank you for your comments, Akiko. I come to like the raisin yeast more and more. 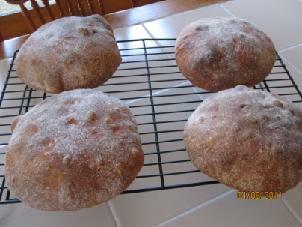 I had another go at the pugliese; I tried 3 variations: Baker's yeast, raisin water and sourdough. The baker's yeast one turned out alright (as always), But the raisin yeast batch is really great. This has been at ambient temperature for 1 night and in the fridge for 24 hours. Wow, That is fantastic, Juergen!! I tried your pugliese with raisin yeast water as soon as I read your new formula. It came out good!! Nice flavor and it has good moist in the crumb!! Could you tell me how to shape the dough? Yours looks perfect! Thank you for your great formula, Juergen! Yours looks great, too. I find the raisin yeast really suits this bread (and wonder if the old romans / italians used raisin yeast? I didn't do any research yet). As for the shaping - I am still on the path. I think, key is to handle the dough very gently - except for the deep tissue therapy at the end. There is a technique to shape rounds by moving the flat hand (edge on table) away from your body and at the same time moving it along the dough so it twists on the table and comes into ball shape fairly easily. To be very gentle with this you can use your free hand to do the contrary movement on the other side of the doughball. Let the edges of your hands and your little fingers keep good contact with the table, this helps to tuck in the dough where it touches the table, to create surface tension. Thank you for your kinds words and the great explanation of your shaping the pugliese. I will be very gentle to preshape and shape the pugliese ..Thank you for your advice, again! The videos are in my bookmarks. I like the way Jeff Hamelman uses his whole body to shape the boules, and how rooted he is. I am comfortable with this technique for doughs of about 65-70% hydration, I can get them really tight quickly. But - with my skills under construction - If I use it for Pugliese I get it too tight. I am glad to know you already put the link in your bookmarks. I will take a look how Hamelman shape the dough for now. Thank you for your notice! I came here to say a thing that you are wondering..
and wonder if the old romans / italians used raisin yeast? I didn't do any research yet). I will be glad to know of what you wonder! I think yeast water relates to winery... But I really don't know about the history how the yeast water came from.. I tried the pugliese yesterday. It is delicious, Juergen! I really don't know what gugliese bread is. Is it like between focaccia and ciabatta? 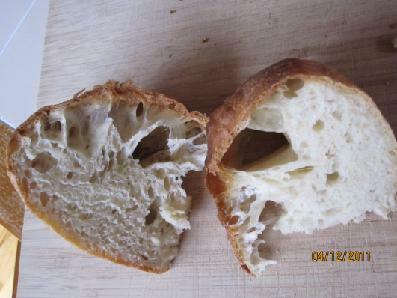 All of my pugliese breads had large holes around the top. Is it a bad thing? I made some tuna-melt sandwiches for dinner. That was really tasty! I baked them at 430F for 20 minutes. I thought it was burning when I saw them at the time. I like the crispy crust and the light crumb. 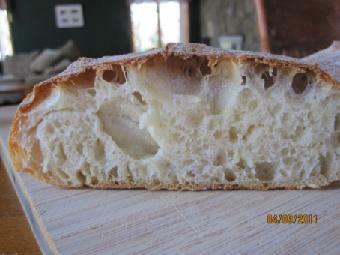 Your Pugliese breads look great! 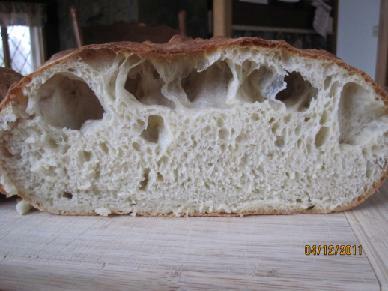 I think, the big, uneven holes are a characteristic of this bread, possibly due to the dimpeling - it might force the gas into larger bubbles. I haven't actually seen the crumb of a Lighthouse-made pugliese, but the loaf I took home from the course looked the same. I'll ask Liz about that. When Liz - our teacher - dimpeled her loaf a cloud of flour rose between her hands! She calls it "the fun bit". I made 2 loaves at the same time. One looked pretty much like the ones I did before (and like yours), and the other one - when I shaped it got too sticky. I had to handle it more than I wanted to get it into a nice shape. 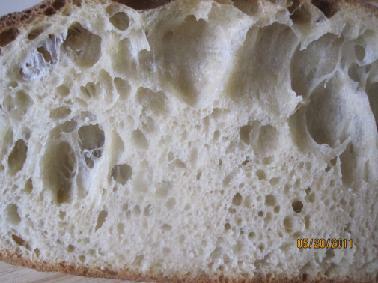 The crumb is quite dense, but it still has the creamy, cool quality. And it has some big holes near the top. And Akiko, As somebody on this site wrote before, you are the Queen of FRUIT Yeast! I think this formula with its low overall yeast content lends itself very well to raisin yeast, and I trust you will make something extraordinary out of it. I made a mistake that I divide the 950g total dough in 4 pieces. I should have made one loaf like you discribed!! I will make one loaf next time. Thank you for sharing your experience, Juergen! I tried it again :) This time, I made a big loaf like you wrote above. Again, I got a lot of holes around the top of the crumb. :0 It certainly tasted good. I think that my ovan is pretty hot, After baking 15 minutes at 430F, It started brown, So I decreased the temperature to 400F to bake more 20 minutes. Should I poke the dough harder? My husband said, " What the heck is that?" :P He ate some of them and left, then came back to eat more .. :) It is kind of funny or funky looking, but it is surely tasty. Thank you, Juergen. By the way, the biga is 3rd day's that I kept it in a refrigerator. 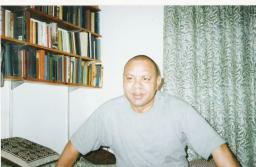 Hi Akiko, Your husband returning to get more - that is success! Your bread looks exactly like the one I took home from the course, except that I had a few more strands between the bottom part and the crust. Judging from your quite even crust you might want to try pushing a bit harder. I think more of "docking" than "dimpling". The question is with the bakers and I am sure they will come back to me with an answer soon. The Biga keeps well in the fridge, I successfully used 5 day old biga. They say you can use it for about a week. When I bake this bread I am always tempted to teake it out quite early.because it turns golden so quickly. I managed to stay calm and leave it in for about 35 minutes. Thank you for taking the time to examine my bread, Juergen. I really appreciate it. Thank you!! I think that I may found the key point from the link you left the last before you get the answer from the bakery. 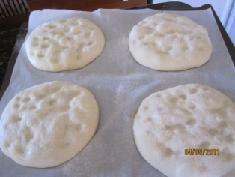 I let the doughs rise for 50 minutes after shaping and then dimpled them heavily. They rose for a further 10 minutes after dimpling. I am glad you enjoy this formula. I think, Shiatsu is the way with this! Good Luck! I made another batch yesterday evening, and dimpeled with a "docking" kind of consciousness (I suppose that is really comparable to a shiatsu touch, I like that connection you made). The loaves came out with less big holes under the crust. I baked the two at the same time. The one on the upper shelf was ready in 35 minutes, the lower one took 40 minutes at 220C, judging from the bottom of the loaves. Thank you for your praise, lumos. Yes, I enjoyed the course very much, but what I enjoy more is how it transformed my baking - before the course and after. Before I went there I wanted to have some questions to ask. That actually got me to really use TFL and try out lots of things. On the course we made 5 different breads with 5 differen pre-ferments - all within 5 hours (the pre-ferments were prepared and ripe). The main things I took from there were the smells, tastes and a feeling for textures of doughs ready for the next step, as well as an impresion of what professional equipment can do. And a great technique to handle lower hydration doughs. The course is held in a small bakery, and production is going on during the course. You see their products going in and out of proofers, retarders and ovens, you see them being shaped etc, and everybody was happy to have a chat. And you ask about other flours. The dough with durum is easier to handle, but you need the durum flour, not fine semolina that's too coarse. And, you make me curious to visit Borough market. Haven't been there for a while. Thank you for the (extremely) promt reply. :D Sorry I erased my post. Didn't realize you're replying it while I was doing it. Wasn't sure which thread was better to post. So glad to finally found someone who've been to Lighthouse's course. It'd take me 2 hrs to drive there from where I live, so I've been contemplating if I should enroll or not. But what you told me is very assuring. I'll have a plenty of time after my daughter starts university in October, so I'll definitely go to enjoy the course. And thank you very much for the information on the flour, too. It's really interesting you found using Italian flours worked best. I was wondering if UK bread flour was suitable for making Puglise, because if my understanding is correct, Italian flour is softer than ours and many Italian chef/cook suggest using 00 flour to make breads in their books. The Puglise I buy in Borough Market does have a slight tint of yellow, but not as much as the one you posted on the other entry.....and definitely not as good looking as yours, either! I haven't got durum semolina flour at the moment, but I still have some leftover 00 flour (which worked great for foccaccia) , so I might try mixing it with strong flour to see how it works. And about the courses, call them and have a chat, they are very approachable. The book that really got me going was Andrew Whitley's Bread Matters, and his trong arguments for using organic flours made me go to Infinity Foods where they sell Shipton Mill flour in 2.5 Kg sacks. I tried other flours, but the Shipton Mill ones are my favourites. Currently O use their No 4 flour, and it works great for prewtty everything I'm doing at the moment - from German rye sourdoughs to Pugliese. The biga comes out tasting sweeter with the No4, and it would be hard for me to tell which I'd prefer. I know what you mean. When I used to work in the City, I never had a time to walk around in London to see 'interesting places.' It's only after I had my daughter and left work, I started exploring those places. BTW you might have tried it already, but if you go to Holborn, a Korean restaurant right next to the tube station is quite good. The facade looks rather cheap and gaily and not too assuring, but the food is much better than its front appearance. They do very reasonable set meals and one bowl which's suitable for quick lunch, too. Yes, the bugs. I had a few of them crawling around after the last delivery, but none were actually in the flour. It seemed that they were just in the packaging. My lilttle one played with (in) the paper sack the flour sack has been delivered in, and he came out of it with a bug crawling on his back. At the Lighthouse Bakery I took the advanced course, but I have the impression that the main things I took away with me were somewhat independent of the theme. And about Holborn: I know the place you mean, I haven't had food there yet, I'll try it. I really like the place called Asap, an indonesian place further down High Holborn, towards Holborn Circus. I enjoyed reading this thread on you bread. it is like a masterclass to me. your bread is as neat as the ones Lumos makes.I am going to try your formula and make this bread by the weekend. I have some durum flour . Which bakeries do you want to visit? Juergen Krauss's Recent Blog Entries.